When Winston Churchill wanted a cigar, which was quite often, if historical accounts are to be believed, one of his favorite brands to reach for was La Aroma De Cuba. At the time, the cigar was made in Cuba, but after the Cuban Revolution the line more or less died out, and so did that little piece of history. Ashton was not fine with that, however. Robert Levin decided that he wanted to try and revive the once-known cigar name, to bring back the cigars that Winston Churchill once enjoyed. He approached Don Pepin Garcia with the idea, and they put together a cigar brand of which they could both be proud, a cigar brand that does justice to the name. Manufactured in the My Father cigar factory in Esteli, Nicaragua, these cigars consist of quality ingredients. They achieve the full flavor and body of the La Aroma De Cuba line by putting together the best Nicaraguan tobacco that they can find, properly aged, with a Connecticut Broadleaf wrapper, consistently delivering a medium-full bodied cigar that is approachable for anyone who is looking to get into darker cigars or for those who’ve smoked them for years alike. When you first light a La Aroma De Cuba Immensa, you get hints of chocolate, brown sugar, and spice. The more you smoke it, though, the more you bring out the earthy flavor and the cedar notes, leaving a pleasant and surprisingly flavorful taste in your mouth. 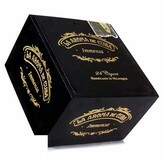 If you are looking for a good medium-full cigar, a box of La Aroma De Cuba Immensas will not go awry. They will serve you well as a good daily cigar, or as cigars for special occasions that you keep in your humidor.